On January 6th 1936, the “Concorde 12 Foot Flying Squadron” was formed which eventually became the “Abbotsford 12 Foot Flying Squadron.” In 1937 the club name was changed to the “Concord, Abbotsford, and Gladesville Flying Squadron” but was commonly known amongst sailors as ‘CAGS’. 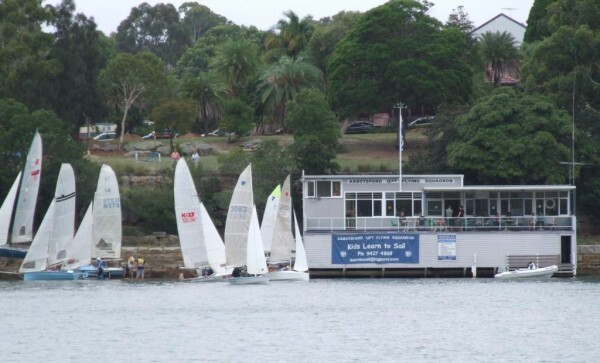 The final name change only occurred in January 1952.Situated on the Parramatta River at the end of Great North Road; Abbotsford Sailing Club operates every Saturday (except Christmas & the first 2 weekends of January). There is a winter program held as well. Whether racing around marks in squally weather or pottering up and down on a sunny day, Abbotsford Sailing Club can provide an environment to fulfill anyone’s sailing ambitions. Over the years the club has hosted many different classes of boat including Vaucluse Juniors, Thorpe 12s as well as the classes sailed today. This entry was posted on October 9, 2012 by Karmen.